DUP MLA Pam Cameron, left, said that she disagreed with the comments of party colleague Sammy Wilson, right. Women who want to breastfeed in the chamber of the House of Commons when other alternatives are available are exhibitionists, East Antrim MP Sammy Wilson has said. Breastfeeding should be done where possible in private areas of the Palace of Westminster, the DUP veteran said, arguing that the confrontational atmosphere of the chamber was unsuitable for children. 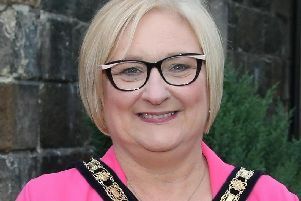 DUP MLA Pam Cameron tweeted to say that she disagreed with Mr Wilson’s views and a DUP spokesman said that his comments represented a personal view, adding that the party recognises that “the benefits of breastfeeding are well established”. Mr Wilson made his comments after an independent report said that MPs should be allowed to breastfeed in the chamber, which it said would allow all members to fully participate in parliamentary business. He told the BBC’s Nolan Show: “This kind of voyeurism that I think some people...to an extent that is how it would be viewed in some cases. “If you have got somewhere else to go why do you have to come into the House of Commons chamber, have it on film and everything else, when there is somewhere else you can give your child its feed? When it was put to him that the word voyeurism suggested something sexual, Mr Wilson said that “voyeurism can be for lots of reasons” and did not always relate to sexual matters. At the start of the discussion, Mr Wilson also criticised the decision of the Nolan Show to lead the programme with the story, saying it was “the kind of trivial nonsense we’ve come to expect from your type of programme”, something Stephen Nolan rejected. The review was conducted by Sarah Childs, a professor of gender and politics at Bristol University, who was seconded to Parliament for a year to address the issue of sexism in Parliament.